... and looks a pleased as Punch with it, even though it's only half-assembled. "Try-out rehearsals have been held with the new State Theatre Orchestra (Union Theatres), selected by Leon Rosebrook, recently arrived from America, and alongside Frank Lanterman, organist-in-chief, Rene Perry will cooperate in novelty presentations incorporating both consoles. Arnold Coleman, now deputy at the Sydney Capitol, has been selected as relieving organist. 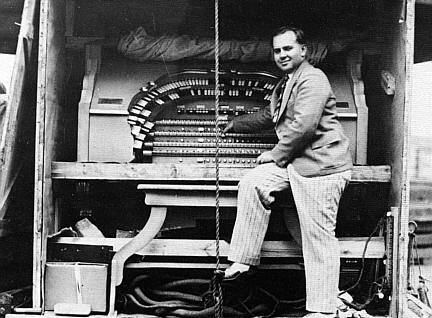 The Wurlitzer being installed by Mr Dodd, of Crowle & Co., is claimed to be the largest ever brought to Australia. The State will be the first theatre west of Chicago, Ill., USA, to be equipped with duplicate consoles. The State organ is almost a third larger than that of the Sydney Capitol, and in addition to twin consoles, each has four keyboards." "Like in some fanciful story out of the past, we are transported on a magic carpet to a new world, where 'neath magic, star-drenched skies, there unfolds before our eyes a lavish, jewel-studded palace. 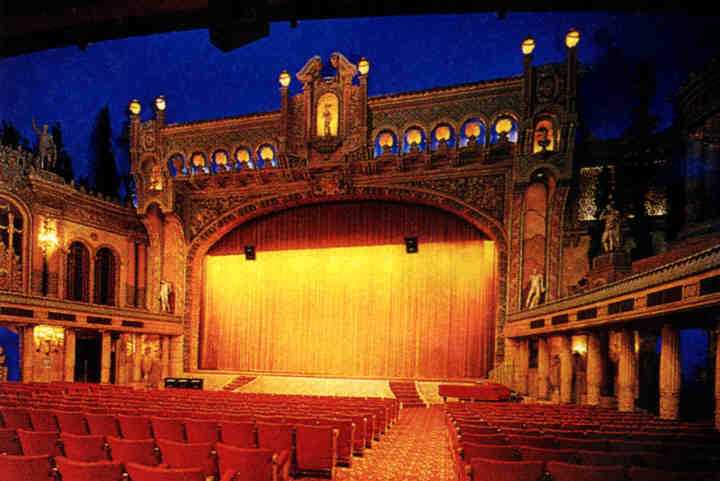 This palace of dreams come true is Union Theatres' great gift to the motion picture lovers of Australia. For within the walls of this dream palace, Australia's greatest theatre, The State, is born an enterprise destined to fill that long-felt want, ready to give you the perfect entertainment that is yours by right. The dream fugue of the State has culminated in a blaze of real beauty that will bring honour and glory to all connected with it. The theme is one that contains endless variations, variations that will bring joy and happiness, variations that will find a solution for the sadness and sorrow that come to all without distinction. 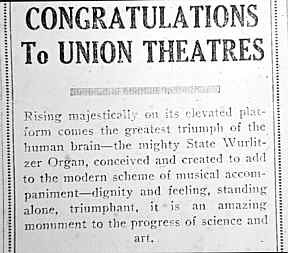 The populace will extol the Union Theatres Ltd. for this matchless building, the apotheosis of grace and as beautiful as the curtain of Solomon. There is but one State. Never was a theatre so beautiful, or its glory so dearly bought but that it fades into insignificance beside this Florentine garden of music, of picture, of song, which you see on Saturday for the first time. To you we extend the welcome of one friend to another. The State is the Personal Theatre, where the Unit in the audience is as important as the Unit on the programme. 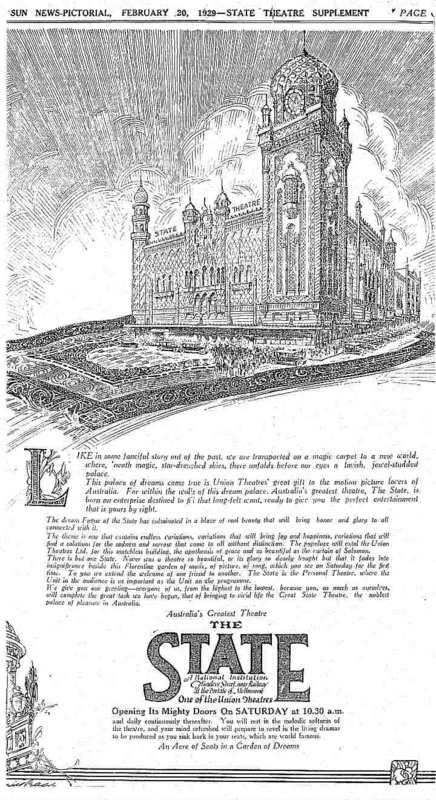 We give you our greeting - everyone of us, from the highest to the lowest, because you, as much as ourselves, will complete the great task we have begun, that of bringing to vivid life the Great State Theatre, the noblest palace of pleasure in Australia. You will rest in the melodic softness of the theatre, and your mind refreshed will prepare to revel in the living dramas to be produced as you sink back in your seats, which are world famous. An Acre of Seats in a Garden of Dreams." 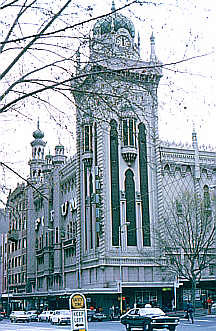 "Crowds were present early Saturday morning at the State Theatre before the doors opened for the morning session, but the big burst of public enthusiasm came at night when crowds jammed Flinders Street so completely that police reinforcements were called out to clear the road and pavements sufficiently to allow patrons to get into the theatre. No opening in the history of Melbourne has aroused so much interest and drawn such crowds. Though controversies have raged regarding the appearance of the theatre by day, opinion is unanimous that by night it is magnificent with its coloured domes and minarets and the silver bosses on the intersections of the mural decorations gleaming under the floodlights. The interior is atmospheric, reminiscent of the Sydney Capitol, but on a larger scale, and the impression fairly paralysed Melbourne. 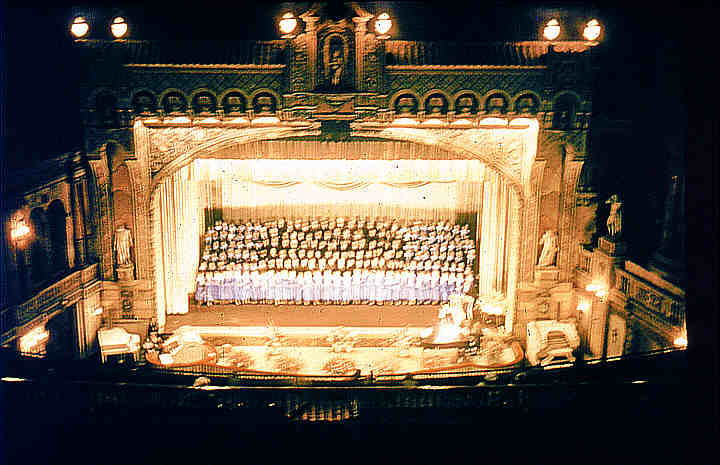 The programme opened with the overture 'Marche Slav', played by the State Unit Orchestra, under Leon Rosebrook, accompanied by Frank Lanterman and Rene Lees at the major and minor consoles of the Wurlitzer. Then followed the introductory announcement, dealing with the theatre, its construction and its aim. The State News and Views, culled from various newsreels, was the third unit. 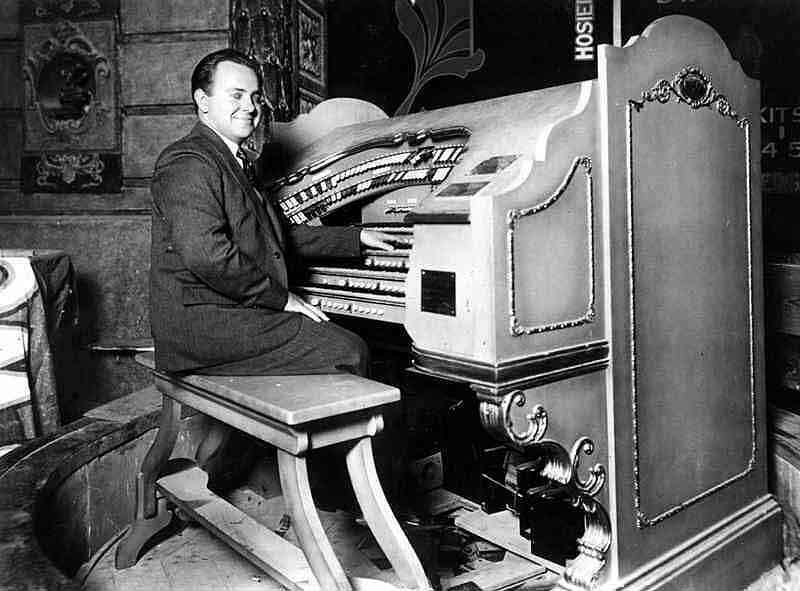 Then Frank Lanterman rendered his original novelty 'Sense and Non-sense' on the organ, followed immediately by Buster Keaton in 'The Cameraman'. 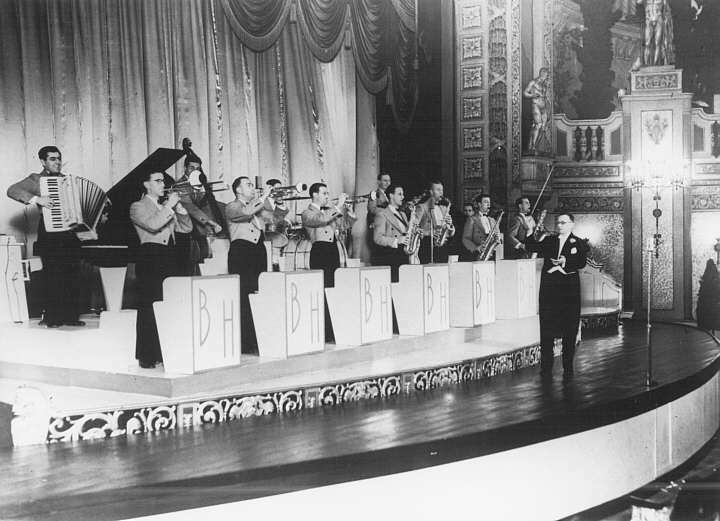 Leon Rosebrook introduced the stage band entertainment, including a fantasy by the State Ballet, and a novelty musical number by soloists. Hits of the night were Deno and Rochelle in their Apache dance, rousing the audience to big applause. As soon as the applause died, the finale, 'Fifty Million Frenchmen Can't Be Wrong', with the stage band, ballet and chorus, brought down the house. After the interval, when W A Gibson and Stuart F Doyle were inundated by congratulations from all sides, 'The Fleet's In' was screened as the last item of the night's entertainment, completing a show that punched along with vim and vigour, and kept everyone on tip-toe with anticipations that were always fulfilled. One thing is certain, Melbourne has never seen a theatre like the State, and never realised the possibilities of film entertainment backed up by presentation as it did on last Saturday night." "The auditorium of the State is little less than amazing. Inner walls rise above the circle like those of a garden - over this is the huge blue dome of artificial sky in which the stars twinkle. By remarkable illumination devices clouds appear to drift slowly across the sky, silhouetted against which are the dark forms of the cypress tress surmounting the walls. 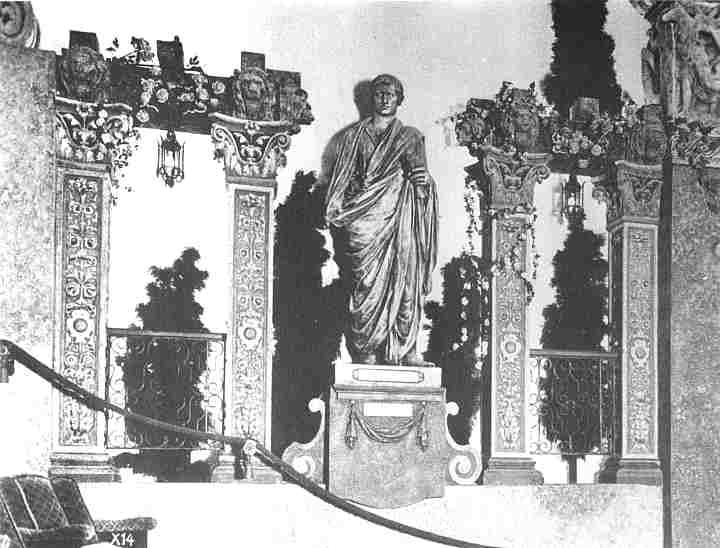 On the right a Florentine temple stands, and all around the auditorium Greek and Italian statuary is placed. 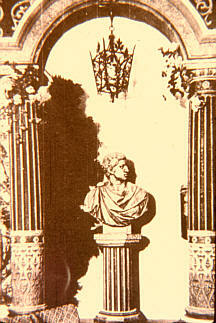 In the temple itself is a reproduction of the Venus de Capua. Marble doves perch amongst the cypresses. 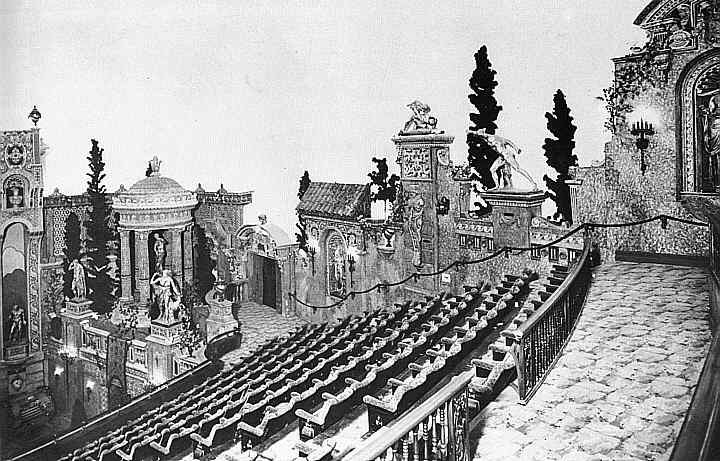 The whole theatre is intended to be seen as a garden, and in the simulation of flowers the object has been to reproduce the profusion of colour in a real garden, rather than strictly formal design. On either side of the massive proscenium are the organ consoles, the larger of which can be lowered or raised on an elevator platform or revolved on its pedestal. Between is the orchestra platform, which can be raised or lowered independently of the organ. There are sixteen complete sets of curtains, some of most costly materials..."
Although the theatre was frequently claimed to have a capacity of 4000, the auditorium seated 3371 (stalls 1999, circle 1372). [Thorne, Ross, Cinemas of Australia via USA, p. 338] It was not unknown at that time for managements to boost their advertised capacity by counting every seat in the building, including lobbies, vestibules, waiting areas, etc. On that basis, the State might have had 4000 seats, even if not all of them were in the auditorium! 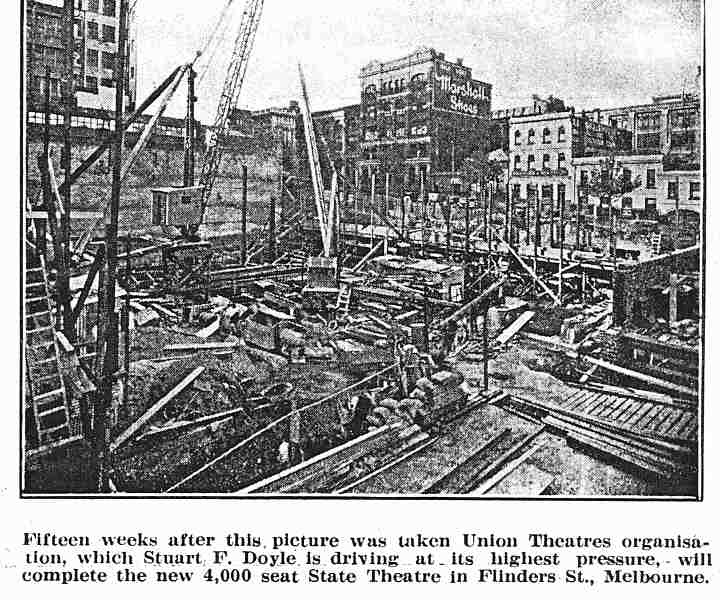 With 3371 seats, though, the theatre was the largest cinema in Australia, and remained so even after the construction of the Regent, Melbourne, and State, Sydney. 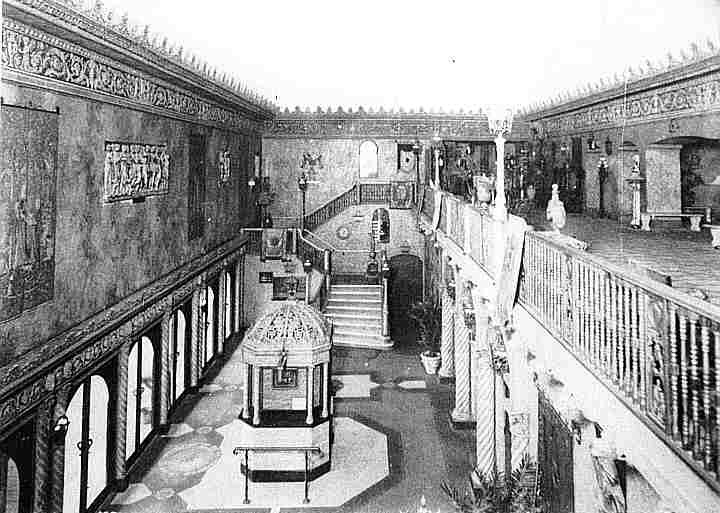 Exaggerated though some of the claims about the theatre may be, the claims about its organ at the time of its opening were true. 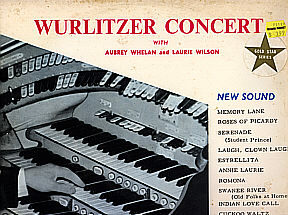 It was the largest Wurlitzer to have been ex-ported from America. 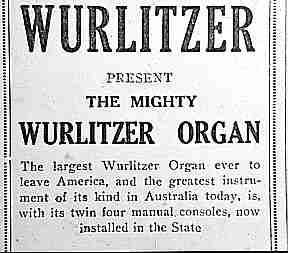 It was the largest Wurlitzer, or indeed, theatre organ by any builder in an Australian theatre. It was over a third larger than the next largest theatre organ in Australia. It did have two four-manual consoles. 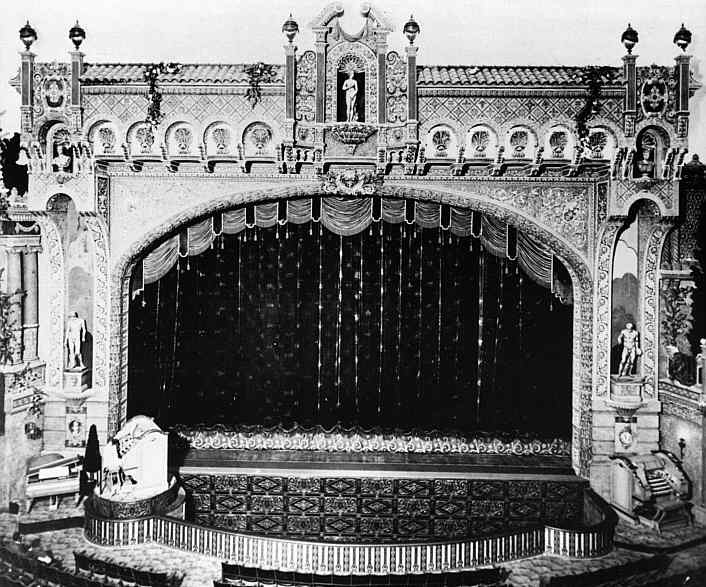 It was the only twin-console Wurlitzer in a theatre west of Chicago (the Fox Theatre, San Francisco, did not open until 28 June, 1929). Although this was not mentioned at the time, the consoles of the State organ were the first in Australia to appear in other than varnished dark wood finish. 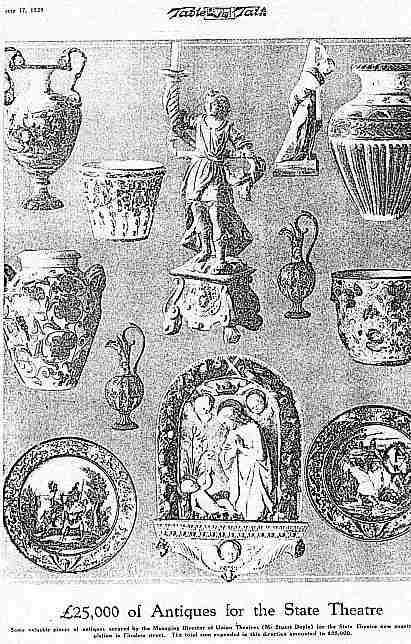 From the start, they were painted cream and gold, initiating a fashion which spread over the nest few years to many other theatre organ consoles. They were also the first "French" style Wurlitzer consoles in Australia. 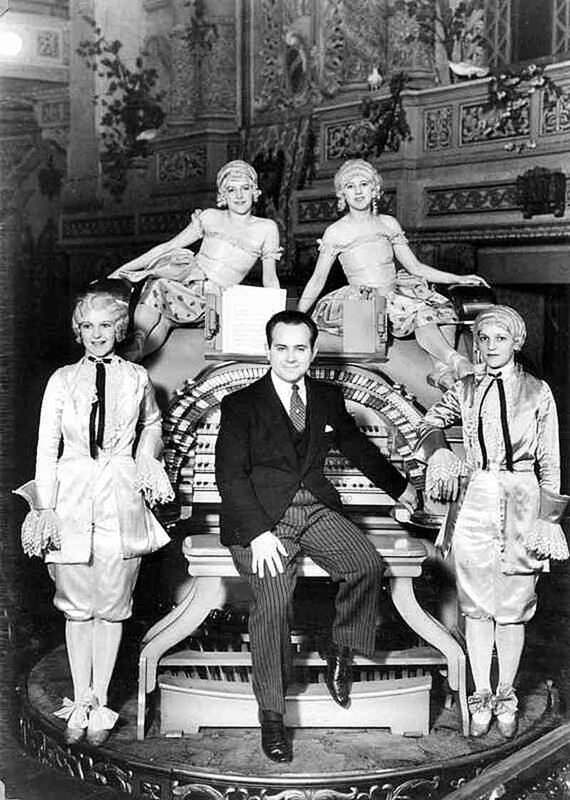 The organ was a Style 270 Wurlitzer, with twenty-one ranks of pipes, which was despatched from the American factory on 31 October, 1928. 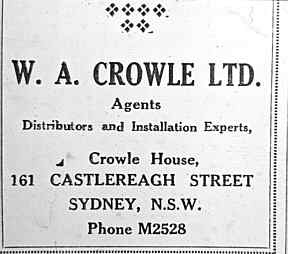 Additional parts were despatched on 22 April, 1929. It is not certain what these parts were, but it is the author's surmise that they included the grand piano attachment, which is not mentioned in any of the descriptions of the organ at its opening. 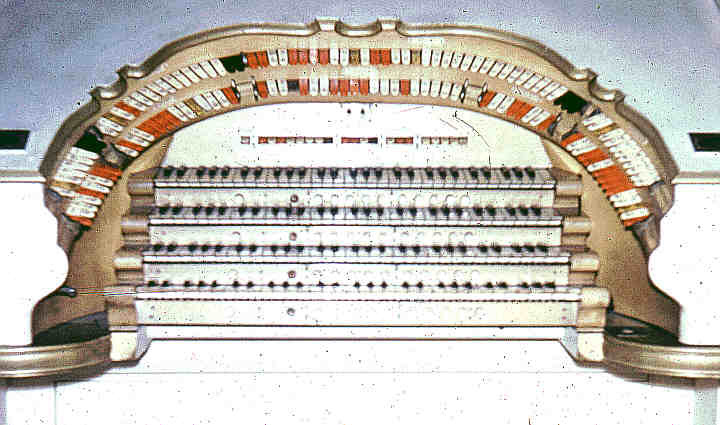 The twenty-one ranks of pipes were located in two chambers, on either side of the proscenium arch, Main on the left, Solo on the right. 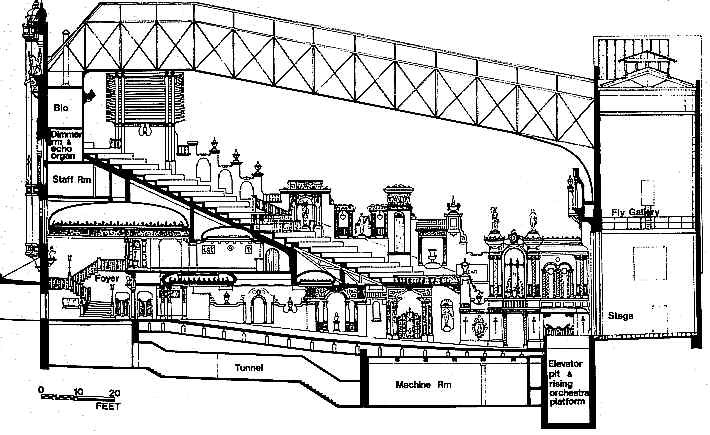 Original plans included an Echo chamber at the rear of the circle (see the architect's drawing above), but this was not implemented. 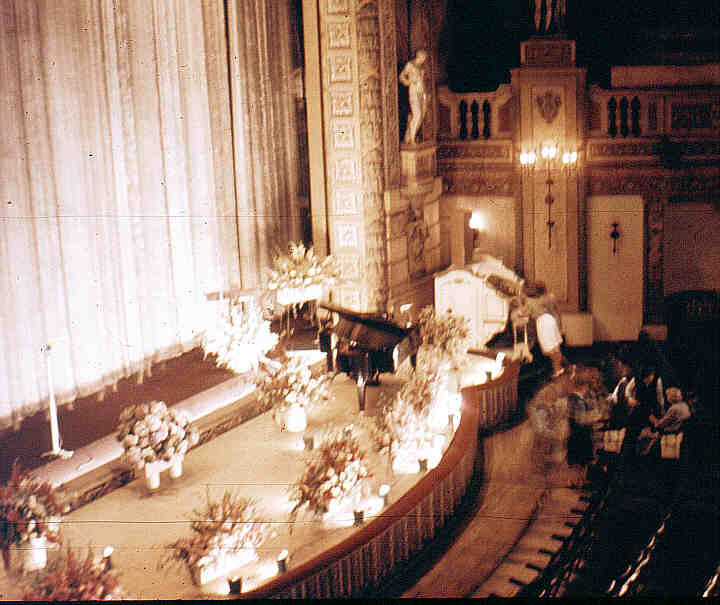 The main console was on a turntable-lift at the left-hand side of the pit, with the grand piano attachment on its left. The "slave" console was in a fixed position at the right-hand side just outside the pit. This secondary console was equipped with stopkeys, but these were dummies only. The manuals played whatever stops were set on the main console; changes could only be made from the "slave" console by using its thumb pistons, as there was only a single set of relays. A single balanced swell pedal was provided on this console, probably more so that the organist could balance than for practical use. Only four Style 270 Wurlitzers were built, each with detail differences. 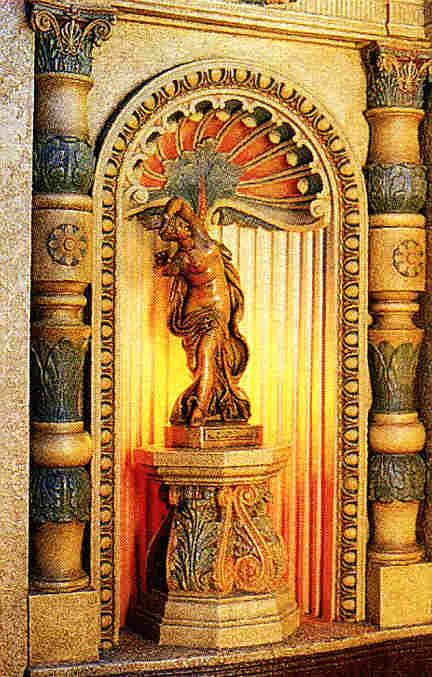 Three were installed in 1929 in Australia, at the State and Regent Theatres in Melbourne, and the State Theatre in Sydney. The fourth went to the Trocadero Theatre, Elephant & Castle, London, in late 1930. Of these, the State, Melbourne, was the only one installed with twin consoles (the second console for the State, Sydney, was never installed there). 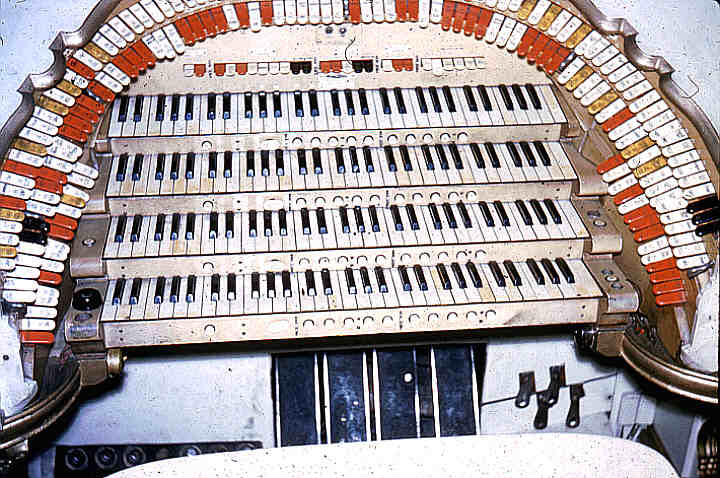 The Regent and Trocadero organs were built with single consoles, and the Trocadero organ had no piano. The State, Melbourne organ originally had an Oboe Horn, whereas the Sydney State had a Krumet. The London organ had an English Horn instead. 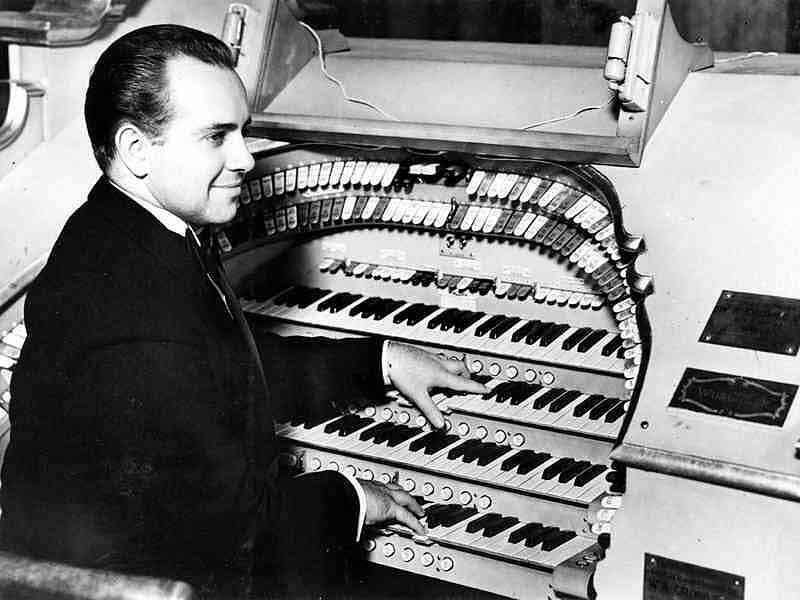 In 1963, the State organ was offered for sale, and was purchased by Gordon Hamilton, who removed it from the theatre with the assistance of TOSA members. It was then stored while a suitable location for its reinstallation was sought. 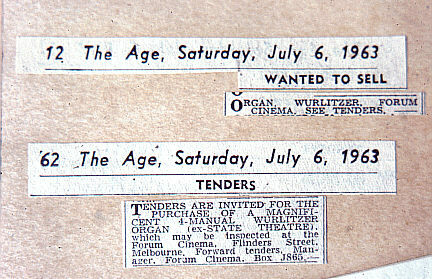 In 1967, the City of Moorabbin agreed to purchase the organ for its new Town Hall, provided that TOSA (Vic) would install it. 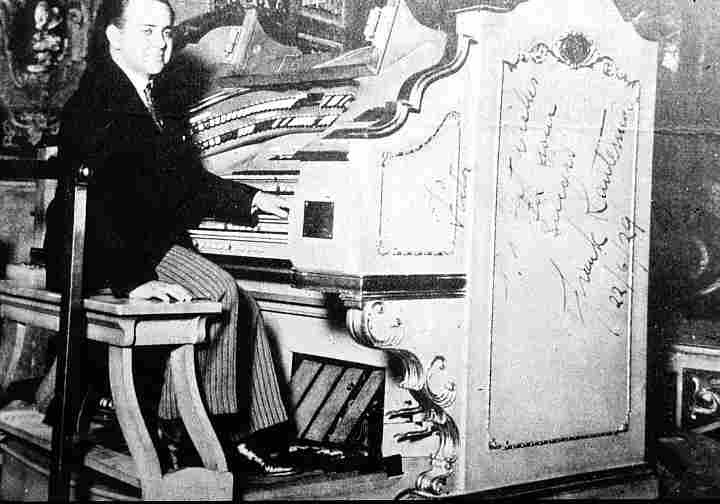 Although Frank Lanterman and Rene Lees were the featured organists at the grand opening on the evening of 23 February, 1929, it was Arnold Coleman, the Assistant Organist, who first played it in public at the earlier session that same day, providing an overture and accompanying the films. 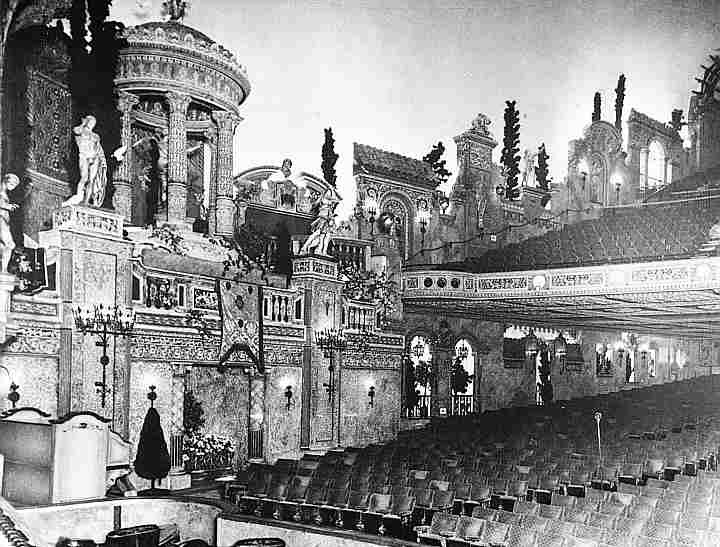 Although talking films were already being shown at the Atheneum and Auditorium cinemas in Melbourne, [Thorne, Ross, Cinemas of Australia via USA, p. 338] the State opened as a silent film theatre, and the three organists must have been kept busy for a few weeks until sound films were introduced. 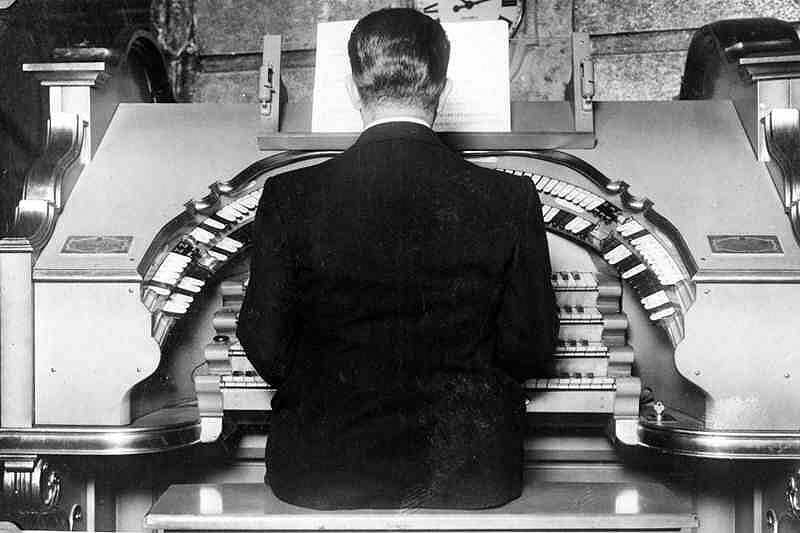 "One night, during Frank's practice routine, Arnold sneaked in and hid on the dual console ... Every time Frank finished playing, the organ would suddenly start to play the last few bars of its own accord. This happened three or four times, and eventually Frank degenerated into a complete nervous wreck and decided it was time to clear right out of the theatre before the ghostly apparition really got to him. I know he got thrown out of a couple of pubs the next day for gibbering. Arnold, of course, told him the next day what had happened, and Frank was somewhat relieved ... Frank Lanterman admitted that he was never quite sure whether or not he had contacted the spirit world and actually heard the Phantom of the Wurlitzer..."
Frank Lanterman returned to America after six months, during which he was unfortunately ill for a while, and Price Dunlavy, who had by then arrived in Australia to open the organ at the State, Sydney, filled in for him. [Leon, Vic, "Sydney's Golden Era of the Theatre Organ", The Diaphone, Sydney, Summer, 1967, p. 6] How long Rene Lees remained at the State is not known. Aubrey Whelan followed Arnold Coleman from 1940 until 1956. He was followed for one year by New Zealander Iris Norgrove. After she left, in 1957, the organ was no longer featured. 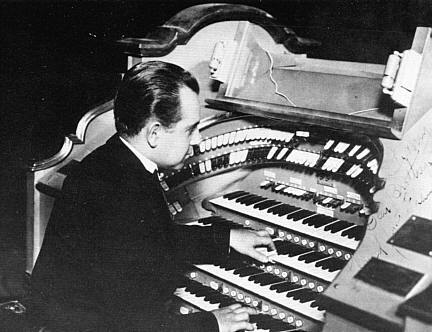 Aubrey Whelan broadcast the State organ during his residency, and also made a number of commercial recordings, featuring duets with Laurie Wilson. Iris Norgrove gave a number of broadcasts and made one LP recording of Scottish music. [Official Opening Programme, Moorabbin Town Hall Organ, 29 April, 1970, p. 9] This record has gained a cult following and is now something of a collectors' item. In the early 1960s, the theatre was converted into two smaller auditoria, a wall being constructed at the front of the dress circle. The former circle became the 627-seat Rapallo Theatre, the former stalls, the 944-seat Forum Theatre. The proscenium and part of the old ceiling remained in the Forum, but the side walls were moved inwards several feet. 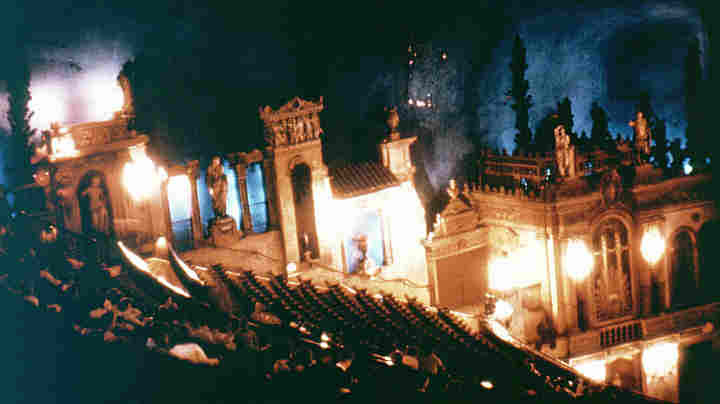 The Rapallo opened in April, 1962, the Forum in December, 1963. 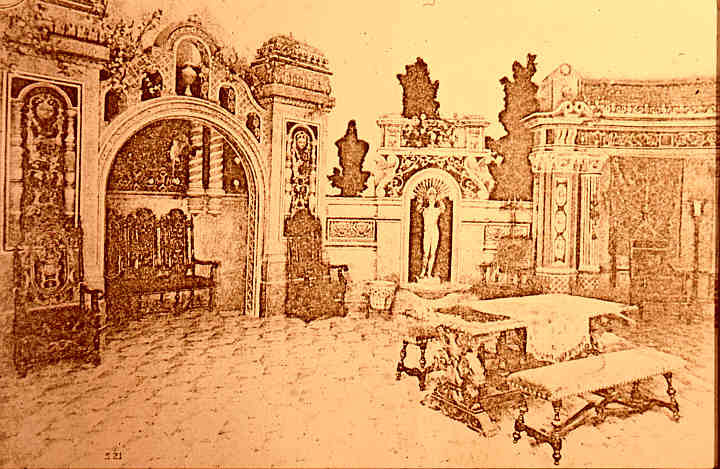 [Tod, Les, and Cook, Kevin, The Dream Palaces - Part One: The Atmospherics, Australian Theatre Historical Society Inc., Seven Hills, NSW, 1988, p.19] The former solo organ chamber became a milk bar, with an entrance from the street outside. 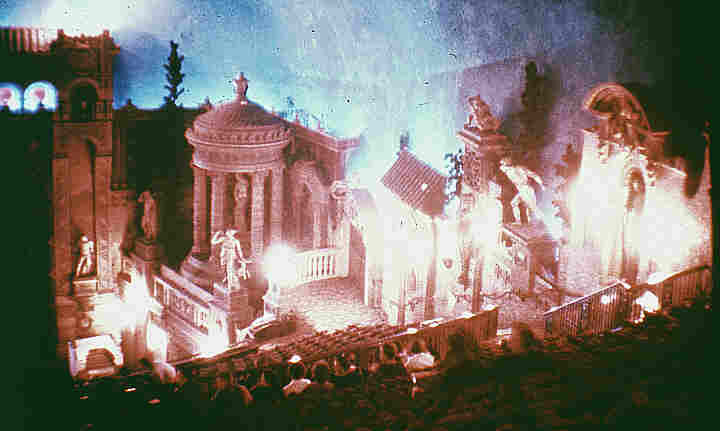 In 1981, both theatres were renovated and renamed Forum 1 (ex-Rapallo) and Forum 2. [Thiele, John, "State Farewell", TOSA News, TOSA (SA), Adelaide, September, 1986, p. 5]Both closed in June, 1986. In the 1990s, the Forum was restored as far as could be done, and has become a heritage attraction.